U sarajevskom hotelu “Europe” održana je Večer bankara u sklopu koje su najuspješnijim bankama uručena tradicionalna priznanja “Zlatni BAM” koja već 16. put, na osnovu izvještaja nezavisnih revizora za poslovanje u prethodnoj godini, dodjeljuje finansijsko-poslovni magazin “Banke i Biznis u BiH”. Uručene su i prigodne Plakete “Zlatni BAM” za poseban individualni i kolektivni doprinos razvoju bankarskog sektora u Bosni i Hercegovini. Najuspješnija žena menadžer u bankarstvu je Sanela Pašić, direktorica Addiko Bank dd Sarajevo, a Plaketu najuspješniji mladi menadžer u bankarstvu primio je Jasmin Spahić, predsjednik Uprave Sberbank BH dd Sarajevo. Mirza Ustamujić, predsjednik Uprave PAYTEN DOO Sarajevo, proglašen je najinovativnijim biznis liderom u 2017. godini, a Berislav Kutle, direktor Udruženja banaka BiH, nagrađen je Plaketom kao doajen u oblasti bankarstva. 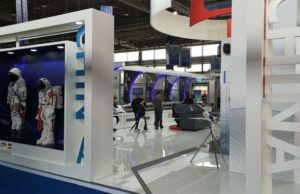 Plakete za najbolju mobilnu aplikaciju u bankarstvu dodijeljene su UniCredit Bank d.d. Mostar i UniCredit Bank a.d. Banja Luka, dobitnica Plakete za najbolju web stranicu i marketing putem web stranice je Sparkasse Bank dd, a za najbolji IT team godine Raiffeisen Bank BH d.d. Kao najbolji provajder bankarskog sektora plaketu je ponio ASSECO SEE d.o.o. 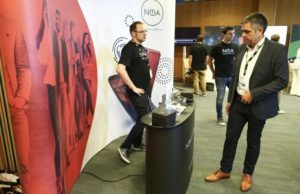 Sarajevo, za najbolju ideju godine – CASHLESS ZONE nagrađena je Intesa Sanpaolo Banka d.d. Sarajevo, dok su za najbolji projekat digitalizacije godine plakete “Zlatni BAM” pripale Sberbank BH d.d. Sarajevo i Sberbank a.d. Banja Luka. 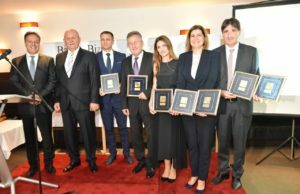 Traditional awards „Golden BAM“, awarded for the 16th time by the financial and business magazine “Banka i Biznis u BiH”, were presented to the most successful bankers in 2017. The „Golden BAM“ is awarded in seven categories, based on reports from independent revisers for business in the previous year. UniCredit Bank d.d. 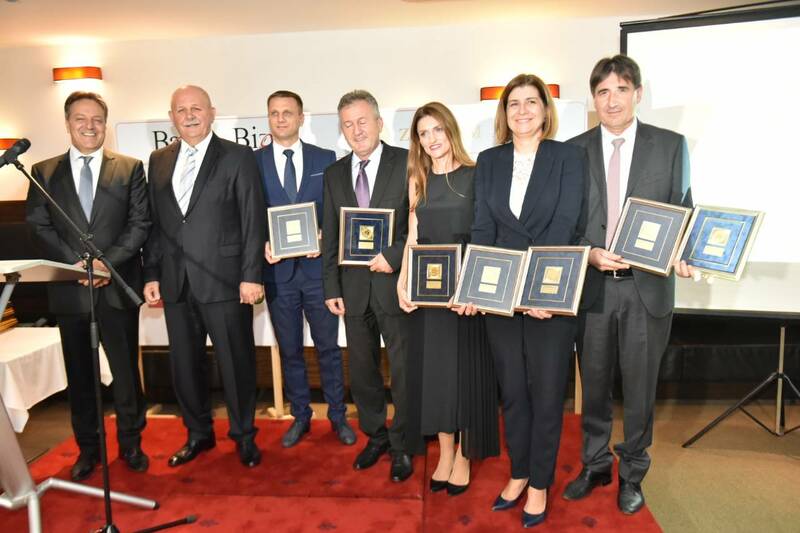 Mostar was awarded with „Golden BAM“ for the largest assets and the largest total capital. NLB Bank a.d. Banja Luka is the winner of two “Golden BAM”, for the highest return on equity capital – ROE and the highest return on assets – ROA. Raiffeisen bank BH d.d. Sarajevo is the winner of “Golden BAM” for the largest share capital, while this recognition for the largest assets of banks with predominantly domestic capital was handed over to „Nova banka A.D. Banja Luka“. The award “Golden BAM” was also given to Union Bank d.d. 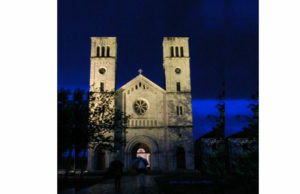 Sarajevo, which had the largest percentage growth of deposits in 2017. In addition to the largest bank awards in our country, this year the appropriate „Golden BAM“ plaques were awarded also to the successful individuals and collectives who serve the banking and financial sector with various products and services. This year, for the special contribution to the development of the banking sector in Bosnia and Herzegovina, the “Golden BAM” plaques were won by Sanela Pasic, director of Addiko Bank d.d. Sarajevo, as the most successful woman manager in the banking sector of Bosnia and Herzegovina; Jasmin Spahić, President of the Management Board of Sberbank BH d.d. Sarajevo, as the most successful young manager in the banking sector of Bosnia and Herzegovina; Mirza Ustamujić, President of the Payten d.o.o. Sarajevo Management Board, as the most innovative leader in the field of banking services. 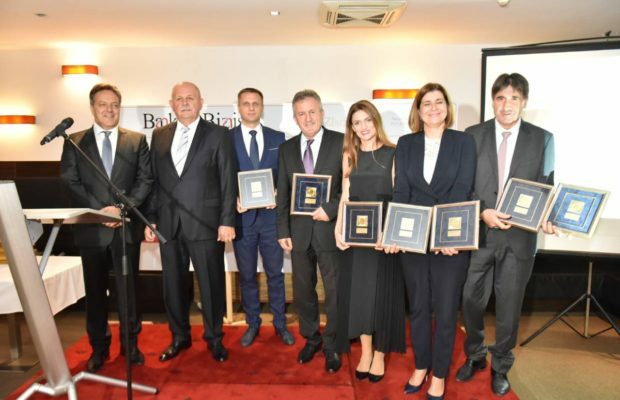 Berislav Kutle, director of the Bank Association of Bosnia and Herzegovina, has earned the „Golden BAM“ plaque as a doyen of banking sector of Bosnia and Herzegovina. The „Golden BAM“ plaque awarded collectives were UniCredit Bank d.d. Mostar and UniCredit Bank a.d. Banja Luka for the best mobile banking application; Sparkasse Bank d.d. for the special quality of the website and web marketing; Raiffeisen Bank BiH d.d. for the best IT team of the year; 0Intesa Sanpaolo Bank d.d. Sarajevo for the best idea of the year; CASHLESS ZONE: Sberbank BH d.d. Sarajevo and Sberbank a.d. Banja Luka for the best digitalization project of the year and the company Asseco SEE d.o.o. Sarajevo, as the best technology provider for banking sector in 2017. ← Previous Story Novi Schumacher u Formuli 1?